Losing the great hymns of our faith has been a concern of mine for a number of years. In this old volume from 1888, we can see how much we have lost by dropping so many meaningful and precious hymns from our services. 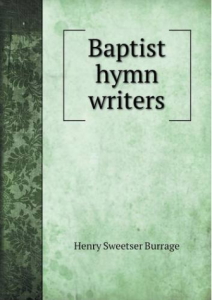 Burrage not only reviews the hymns, complete with all the words of each hymn, but gives us a good biographical background of each writer. The volume I have is so organized that one can easily read it in sections as time permits. The sections are ordered by country of the writer, by writer’s names, and best of all, in chronological order. And, there is a double index (first lines and names), something often missing in older books. While reading through the section on English hymn writers, I could relive our trips through Bedford, Birmingham, Bristol, Edinburgh, Kettering, Leicester, London, Milton, Olney, Oxford, Nottingham, and Plymouth among many others. To know that I walked where these great hymn writers did is a precious memory. There is an extensive section beginning on page 101 about the Ryland family which took great efforts to preserve these hymns as well as sermons and texts we might not otherwise have. The book also follows at least a dozen missionaries who came after William Carey, the father of Baptist Missions, to parts of India and especially continued the work in Serampore while writing hymns for singing in the Seminary there. In case you did not know, that college in Serampore is still thriving from Carey’s first landing in 1793. Other branches have spread throughout India. It reads like a huge family tree with Carey at the base of the tree. On pages 79-84, we read about one of Pastor Rick’s favorite hymns, “Blest Be the Tie That Binds”, which was written by John Fawcett in the 1770’s and tells of his planned move to London to replace the great John Gill who had passed away. Fawcett finally realized he could not give up his congregation in Bradford. This hymn survives in many of our standard hymn books. Pages 267-270 tell of the work of Adoniram Judson, the American writer and missionary who is often given the distinction of founding America’s Baptist missionary work and who finally served in India , translating the Bible in to Burmese. Come to the Savior now! Forth from His wounded side. “Tis finished,” now He cries. Now bows His head and dies.